I know we took a week off from the Holy Spirit Series. I want to jump back in to talk about the gifts of the Holy Spirit. We talked about what they are a few posts ago. I want to encourage you not to limit God to a list. The Holy Spirit is fully God and can manifest His Presence in ways we may not understand. Scriptures are filled with stories of ordinary people encountering an extraordinary God. Has God changed or have our expectations of what He will do changed? I truly believe we don’t expect much from God anymore. Since we in the Western world have so many options, it’s easy to bypass God. We rely on ourselves, others, intellect, or our abundant resources. On missions we’ve seen more people giving their hearts to God, healed of sickness and diseases, and encountering God in powerful ways. What’s the purpose of all these gifts of the Spirit? To build up the body of Christ. To demonstrate the love of Christ. Love and power combine to bring heaven to earth. 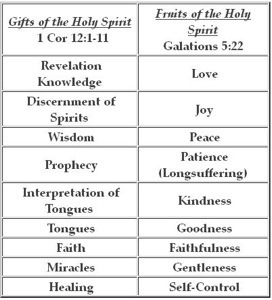 Let’s look at the gifts coupled with the fruit of the Spirit. The attributes of God are manifest through the gifts. This is a revelation gift. …this gift involves having a sense of divine direction, being led by the Holy Spirit to act appropriately in a given set of circumstances, and rightly applying knowlege. The gift of wisdom is the wisdom of God. It is the supernatural impartation of facts; it is not natural. You can’t earn it. It is received from God through prayer (Ephesians 1:17). Discerning of spirits is the supernatural ability given by the Holy Spirit to perceive the source of a spiritual manifestation and determine whether it is of God (Acts 10:30-35), of the devil (Acts 16:16-18), of man (Acts 8:18-23), or of the world. It is not mind reading, psychic phenomena, or the ability to criticize and find fault. Discernment will also enable you to recognize the Holy Spirit in another person. Supernatural utterance in languages not known to the speaker; these languages may be existent in the world, revived from some past culture, or “unknown” in the sense that they are a means of communication inspired by the Holy Spirit (Isaiah 28:11; Mark 16:17; Acts 2:4, 10:44-48, 19:1-7; I Corinthians 12:10, 13:1-3, 14:2, 4-22, 26-32). The spiritual gift involving ability to speak in foreign language(s) not previously studied or to respond to experience of the Holy Spirit by uttering sounds which those without the gift of interpretation could not understand. At Pentecost the church received the gift to communicate the gospel in foreign languages (Acts 2). God gave His Spirit to all His people to empower them to witness and prophesy. In Corinth some members of the church uttered sounds the rest of the congregation did not understand (I Corinthians 12-14). This led to controversy and division. Paul tried to unite the church, assuring the church that there are different gifts but only one Spirit (I Corinthians 12:4-11). Interpretation of tongues is a supernatural verbalization and subsequent interpretation to reveal the meaning of a diverse tongue. This gift operates out of the mind of the Spirit rather than out of the mind of man. Prophesy is speaking God’s words and agenda for the building up of the Body and others. It is to encourage, edify, warn, and correct. Paul tells us about prophecy in 1 Corinthians 14:1. Let love be your highest goal! But you should also desire the special abilities the Spirit gives–especially the ability to prophesy,~1 Corinthians 14:1. All prophecy is to be tested. Meaning we take what’s said and weigh it against God’s word and character. Prophecy is divinely inspired and anointed utterance; a supernatural proclamation in a known language. It is the manifestation of the Spirit of God – not of intellect (I Corinthians 12:7), and it may be possessed and operated by all who have the infilling of the Holy Spirit (I Corinthians 14:31). The gift of faith is the supernatural ability to believe God without doubt, combat unbelief, and visualize what God wants to accomplish. It is not only an inner conviction impelled by an urgent and higher calling, but also a supernatural ability to meet adverse circumstances with trust in God’s words and messages. The gift of healings refers to supernatural healing; it is a special gift to pray for specific diseases. Healing can come through the touch of faith (James 5:14-15); by speaking the word of faith (Luke 7:1-10); or by the presence of God being manifested (Mark 6:56; Acts 19:11-12). A miracle is the performance of something which is against the laws of nature; it is a supernatural power to intervene and counteract earthly and evil forces. The word miracles comes from the Greek word dunamis which means “power and might that multiplies itself.” The gift of miracles operates closely with the power gifts of faith and healings to bring authority over Satan, sickness, sin, and the binding forces of this age. Miracles can also be defined as supernatural intercessions of God. God exhorts us with energy to do something that is not natural or normal to us. Just as the ministry gift of miracles is the expression of prayer, so is the function of the Holy Spirit to direct our prayers (Romans 8:26). 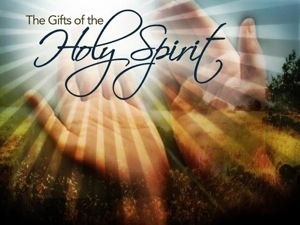 The gifts of the Spirit are available to all believers. Some believe if a gift isn’t apparent in their life, then that’s it. Paul encouraged people to desire and ask God for the gifts. Gifts as stated before are not signs of spiritual maturity or to be used to abuse people. They are to be led by the Holy Spirit and measured by the fruit of the Spirit. Father, I ask we would fully believe the Holy Spirit is capable of all things. He is fully God. He can do all things. Help us to rely fully on Him. In Jesus powerful name, amen.